NEW SANGSIN BRAKE PART NUMBER FOR THE AFTERMARKET RANGE To compete with global aftermarket manufacturer, We are constantly updating our product range in order to guarantee full coverage of the car park. New Sangsin Part Numbers are available for European,Asian,American Vehicles. Please don't miss the attached file and contact us via e-mail(sbexport@sangsin.com) if you have any question. Automechanika Istanbul SANGSIN BRAKE participate in Automechanika Istanbul 2019. It will be a great pleasure to welcome you at our stand. Our exhibition information is as below *DATE: 4 April - 7 April 2019 *LOCATION: TUYAP Fair, Convention and Congress Center *COMPANY NAME: SANGSIN BRAKE *STAND NO. : HALL 8 / STAND D175 *ATTENDEES: Yoonkyo Chung (Team Manager), Hyunwoo Kim (Assistant Manager), Junghoon Kang (Assistant Manager) If you plan to visit AMI 2019 , Please book the meeting by e-mail (sbexport@sangsin.com) We are looking forward to meeting you soon. ACMA Automechanika New Delhi SANGSIN BRAKE participate in Automechanika New Delhi 2019. It will be a great pleasure to welcome you at our stand. Our exhibition information is as below *DATE: 14 February - 17 February 2019 *LOCATION: Pragati Maidan, New Delhi, INDIA *COMPANY NAME: SANGSIN BRAKE *STAND NO. : HALL 11 / STAND C61 *ATTENDEES: Dongho Bae(Director) , Junghwan Bang (Manager) If you plan to visit ACMA 2019 , Please book the meeting by e-mail (sbexport@sangsin.com) We are looking forward to meeting you soon. AUTOMECHANIKA SHAGHAI 2018 Thank you for visiting our booth during AMS 2018 ! We pray for the prosperity of your esteemed company. The winter is around the corner. Have a great Christmas and happy New Year! AUTOMECHANIKA SHANGHAI 2018 SANGSIN BRAKE participate in AMS 2018. It will be a great pleasure to welcome you at our stand. Our exhibition information is as below *DATE: 28 November - 1 December 2018 *LOCATION: National Exhibition & Convention Center, Hongqiao, Shanghai, P.R. CHINA *COMPANY NAME: SANGSIN BRAKE *STAND NO. : HALL 2 / STAND 2E108 *ATTENDEES: Hyun Bae Choi (Director) , Ho Jun Song (Team Manager), Yoon Kyu Chung (Team Manager), Ji Yoon Jung (Manager) If you plan to visit AMS 2018 , Please book the meeting by e-mail (sbexport@sangsin.com) We are looking forward to meeting you soon. AAPEX 2018 SANGSIN BRAKE participate in AAPEX in November. It will be a great pleasure to welcome you at our stand. Our exhibition information is as below *DATE: 30th Oct - 1st Nov, 2018 *LOCATION: Sands Expo, LAS VEGAS, NV *COMPANY NAME: SANGSIN BRAKE *STAND NO. : 2068 *ATTENDEES: Hyun Bae Choi (Director), Tae Sung Kim (Team Manager), Sung Jun Kim (Assistant Manager) If you plan to visit AAPEX , Please book the meeting by e-mail (sbexport@sangsin.com) We are looking forward to meeting you soon. KOAA SHOW 2018 SANGSIN BRAKE participate in KOAA SHOW in October. It will be a great pleasure to welcome you at our stand. Our exhibition information is as below *DATE: 17th ~ 19th, October, 2018 *LOCATION: Song Do Convensia, Incheon, KOREA *COMPANY NAME: SANGSIN BRAKE *STAND NO. : HALL 2 / STAND 2201 *ATTENDEES: Hyun Bae Choi (Director) & All of the Overseas Sales Managers in SANGSIN BRAKE If you plan to visit KOAA SHOW 2018 , Please book the meeting by e-mail (sbexport@sangsin.com) We are looking forward to meeting you soon. AUTOMECHANIKA FRANKFURT 2018 SANGSIN BRAKE participate in AUTOMECHANIKA FRANKFURT in September. It will be a great pleasure to welcome you at our stand. Our exhibition information is as below *DATE: 11st ~ 15th, September, 2018 *COMPANY NAME: SANGSIN BRAKE *STAND NO. : HALL 5.1 / STAND E29 *ATTENDEES: Mr. Hyun Bae Choi (Director), Mr.Yoon Kyu Chung (Team Manager) Mr.Hojun Song (Team Manager), Mr.Hyunwoo Kim (Assistant Manager) If you plan to visit Automechanika Frankfurt 2018, Please book the meeting by e-mail (sbexport@sangsin.com) We are looking forward to meeting you soon. 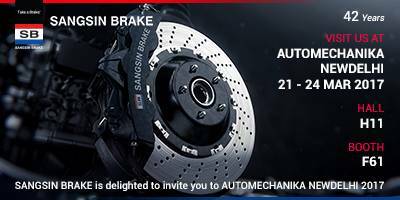 AUTOMECHANIKA DUBAI 2018 SANGSIN BRAKE participates in AUTOMECHANIKA DUBAI 2018 It will be a great pleasure to welcome you at our stand. Our exhibition information is as below. ※DATE: 1st ~ 3rd,May,2018 ※LOCATION: Dubai World Trade Centre ※COMPANY NAME: SANGSIN BRAKE ※STAND NO. : HALL#3, BOOTH #12 ※ATTENDEES: Mr. HyunBae Choi (Director), Mr. SangNyon Kim (Managing Director) Mr. HoJun Song(Team Mananger), Mr. JeongHoon Kang (Manager) Mr.YoungLok Cho (Assistant Manager) If you plan to visit Dubai Automechanika, Please book the meeting by e-mail(sbexport@sangsin.com) We look forward to meeting you soon! AUTOMECHANIKA HO CHI MINH CITY, 2018 SANGSIN BRAKE will participate in Automechanika HO CHI MINH CITY 2018 at SECC in April. It will be a great pleasure to welcome you at our stand. Our exhibition information is as below: ※Date: 25th - 27th of April, 2018 ※Location: Saigon Exhibition and Convention Center, Ho Chi Minh City, Vietnam ※Company Name: SANGSIN BRAKE ※Stand No. : B14 ※Attendees: Mr. Hyunbae Choi (Executive Director) Mr. Yoonkyu Chung (Team Manager), Mr. Junghwan Bang (Manager) If you plan to visit Ho Chi Minh City, Please contact us to book the meeting. (sbexport@sangsin.com) We look forward to meeting you soon. NEW SANGSIN BRAKE PART NUMBER FOR THE AFTERMARKET RANGE To compete with global aftermarket manufacturer, We develop more than 100 brake pads every year. We are constantly updating our product range in order to guarantee full coverage of the car park. New Sangsin Part Numbers are available for European,Asian,American Vehicles. Please don't miss the attached file and contact us via e-mail(sbexport@sangsin.com) if you have any question. GREETINGS! SANGSIN BRAKE will participate in AUTO EXPO COMPONENTS 2018 in New Delhi on Feb. It will be a great pleasure to welcome you at our stand (Hall A, Stall 9). Our exhibition information is as below: ※Date: 8th ~ 11st,February,2018. ※Location: Pragati Maidan, New Delhi, India ※Company Name: SANGSIN BRAKE ※Stand No. : HALL A / STALL 9 ※Attendees: Mr. Yoonkyu Chung (Team Manager) Mr. Hyunwoo Kim (Assistant Manager) Mr. Dongho Bae (Sangsin Brake India Sales Team Manager) If you plan to visit AUTO EXPO INDIA 2018, Please book the meeting by e-mail ( sbexport@sangsin.com). We are looking forward to meeting you soon. GREETINGS! SANGSIN BRAKE will participate in AUTOMECHANIKA SHANGHAI 2017. It will be a great pleasure to welcome you at our BOOTH# 2D132, Hall 2. Our exhibition information is as below: Date: 29th Nov. - 2nd Dec. Location: National Exhibition and Convention Center(Shanghai), China Name: SANGSIN BRAKE Booth No. : 2D132,Hall 2 Attendees: Mr. Hyunbae Choi (Executive Director), Mr. Jinwoo Kim (Assistant Manager), Ms. Gahee Cho (Assistant Manager) If you plan to visit automechanika Shanghai 2017, Please book the meeting by e-mail ( sbexport@sangsin.com). Greetings! SANGSIN BRAKE will participate in IAPEX in Tehran. We sincerely invite you to visit our booth on Nov. Our exhibition information is as below Date : 13th ~ 16th, November, 2017 Location : Tehran International Exhibition Center (Tehran Permanent Fairground) Name: SANGSIN BRAKE Stand No: HALL 38 / 3801 Attendees: Mr.Sangnyon Kim(General manager of Dubai sales office) Mr.Dong Ho Bae(Sangsin Brake India factory Sales team manager) Mr.Justin Lee(Overseas Sales team Manager) Mr.JiYoon Jung(Overseas Sales team Assistant Manager) If you plan to visit IAPEX 2017, Please book the meeting by E-mail(sbexport@sangsin.com) We are looking forward to seeing you soon. Bienvenue! SANGSIN BRAKE will participate in Equip Auto 2017 in Paris on October. It will be a great pleasure to welcome you in our Stand# E061, Hall 2.2, on October. Our exhibition information is as below: Date: 17th ~ 21st, October, 2017 Location: PARIS EXPO PORTE DE VERSAILLES Name: SANGSIN BRAKE Stand No. : Hall 2.2 / E061 Attendees: Mr. Hyunbae Choi (Managing Director), Mr. Sangnyon Kim (General Manager of Dubai sales office) Mr. Hyunwoo Kim (Assistant Manager) If you plan to visit Equip Auto 2017, Please book the meeting by e-mail (sbexport@sangsin.com). We are looking forward to meeting you soon. We kindly inform you that our offical agent in Russia will participate in MIMS Automechanika Moscow as an exhibitor. We sincerely invite you and your company representatives to visit our booth at Automechanika. Our exhibition detailed information as below Date: 21st ~ 24th, Aug. 2017 Location: Expocentre, Moscow Hall & Booth Number: PAVILION 2, HALL 1, A343 Attendee: Mr. Yoonkyu Chung (Team Manager), Mr. Daniel Hochang Yoon (Assistant Manager), * Mr. Chung and Mr.Yoon are available ot meet only from Aug. 21st to 23rd. It would be a great pleasure to meet you at the exhibition. The Automechanika Dubai is held in May. We sincerely invite you and your company representatives to visit our booth at Automechanika. Our exhibition detailed information as below: Date: 7th ~ 9th, May 2017 Location : Dubai International Convention Centre Company name : SANGSIN BRAKE Hall & Booth Number : H3-B12 Attendee: Mr. Hyunbae Choi (Managing Director), Mr. Sang Nyon Kim (Dubai Branch Manager), Mr. Jung Woong Lee (Team Manager), Mr. Young Hoon Kang (Assistant Manager), Mr. Jeong Hoon Kang (Assistant Manager) It would be a great pleasure to meet you at the exhibition. Please let us know at any time if you have a plan to visit to Automechanika Dubai. The Automechanika Istanbul is held on Aprill. We sincerely invite you and your company representatives to visit our booth at Automechanika. Our exhibition detailed information as below: Date: 6th ~ 9th, Aprill 2017 Location: Tüyap Fair, Convention and Congress Center, Istanbul Company name: SANGSIN BRAKE Hall & Booth Number: Hall 8 / Stand A147 Attendee: Mr. Hyunbae Choi (Managing Director), Mr. Yoonkyu Jung (Team Manager), Mr. Hyunwoo Kim (Assistant Manager) It would be a great pleasure to meet you at the exhibition. Please let us know at any time if you have a plan to visit to Automechanika Istanbul. The Automechanika New Delhi is held on March. We sincerely invite you and your company representatives to visit our booth at Automechanika. Our exhibition detailed information as below: Date: 21st ~ 24th, MAR 2017 Location: Pragati Maidan, New Delhi Company name: SANGSIN BRAKE Hall & Booth Number: H11 F61 (KOREA PAVILION) Attendee: Mr. Dong ho Bae (Senior Manager), Mr. JiYoon Jung (Assistant Manager) It would be a great pleasure to meet you at the exhibition. Please let us know at any time if you have a plan to visit to Automechanika New Delhi. Copyright© 2017 Sangsin Brake Co., Ltd. All Rights Reserved.